Want to build your own robots? 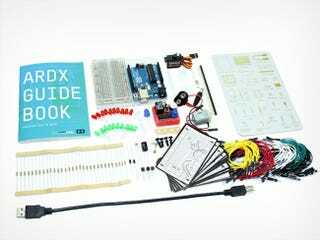 This Complete Arduino Starter Kit + Course Bundle gets you all the hardware you’ll need, plus 25 hours of hands on training to help you conquer any DIY project you can dream up. Right now, Kotaku readers can pick it up for nearly 90% off - just $59.99 with free shipping. Arduino is the ultimate do-it-yourself open source electronics platform, allowing you to integrate any digital and physical signals so you can create anything from simple sensors to robots - there’s no limit on the possibilities of what you can hack together. The total value of this bundle is over $500, but for a limited time, Kotaku readers can pick it up for over 88% off - just $59.99 with US shipping included. Grab one for yourself and the DIY tinkerer on your list, but don’t wait - this offer won’t last long. Hit the link below to purchase.